Bet you didn’t know the ol’ hair-of-the-dog hangover cure has a scientific basis. You open your eyes and immediately regret doing so. You dread getting out of bed (or off your front lawn) to find out exactly how bad you feel, but you’ll die if you don’t get a glass of water. You spend the day feeling raw, lethargic and nauseous as you rack your brain to remember what you did to deserve this. Yes, you have a hangover. It’s a pain that only drinkers know, and ever since those genius monks brewed the first spirits, humanity has been on a quest to cure the consequences of overindulgence. Theories abound as to cures and treatments, one of which involves, simply, consuming more alcohol in the morning. Drinking the next day sounds unhealthy and potentially dangerous. However, there is actual scientific research, it turns out, to back it up. According to U of U addiction specialist Glen R. Hanson, “You can almost always relieve a hangover by drinking some more.” It’s a reasonable theory, considering how alcohol interacts with the body. As the body metabolizes alcohol quickly, it becomes accustomed to the drug and makes certain chemical adjustments in order to cope. These chemical adjustments balance out the sedative nature of alcohol by pumping the body with stimulants. When your liver finishes up its work and the alcohol leaves, things get uncomfortable. The stimulating chemicals are still present, hence the agitation, irritability, sensitivity and allaround raw feeling. Drinking more alcohol can counteract the leftover chemicals in your body and act as a sedative all over again. However, if using this method, keep consumption to a minimum. More alcohol can help balance the chemical in your body and take off the edge, but the longer detoxification process is inevitable. While your liver can metabolize large quantities of alcohol, it creates byproduct chemicals and enzymes that cause a slew of temporary and long-term problems. One of the effects is that your liver is inhibited from producing glucose (the body’s power source) for the brain. This is why, by afternoon, many drinkers become melancholy, braindead zombies. Unfortunately, their drinking more booze will only delay their return to sobriety. Thus, the “hair of the dog” shouldn’t be a frequent hangover cure. Not only does it tax and potentially damage your liver, but “morning-after” drinking is a habit you most likely do not want to develop. Clear liquors have fewer byproducts, meaning less stuff for your liver to process. Stick with a decent vodka for the same reason. Fresh, pure citrus juices like orange, grapefruit and lemonade replenish your body with fructose. If you have the energy, squeeze your own. Beer with tomato juice may not be the tastiest, but the lowalcohol content in Utah beer does the job without going overboard. Try a light beer to reduce fermentation byproducts. Chilled champagne or sparkling wine with fresh orange juice is refreshing, packed with fructose and is probably the tastiest and most low-key morning cocktail. Again, stick with a good vodka. Tomato juice is suggested in this case to keep things as simple as possible while providing some fructose. Add a dash of celery salt, black pepper and salt. If you want a kick, add Worcestershire or Tabasco to taste. 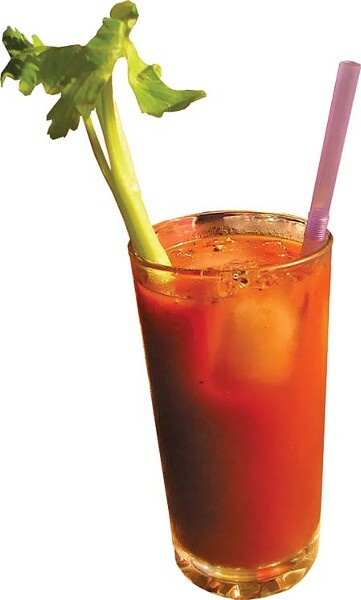 Garnish with celery and olives or add a splash of olive juice. Use a lot of ice. Lemon and lime slices make it more palatable. It’s also a great preventative drink. You can be sure you’re not getting any extra sugar or byproducts, and the ice keeps you hydrated. Classic hangover cures like greasy food, water, rest, pain relievers, cold showers and mild physical activity remain good standbys. And how about not overdoing it in the first place? But that wouldn’t be any fun, now would it?